Neil McGuigan & John Torode launch new collaboration wine. 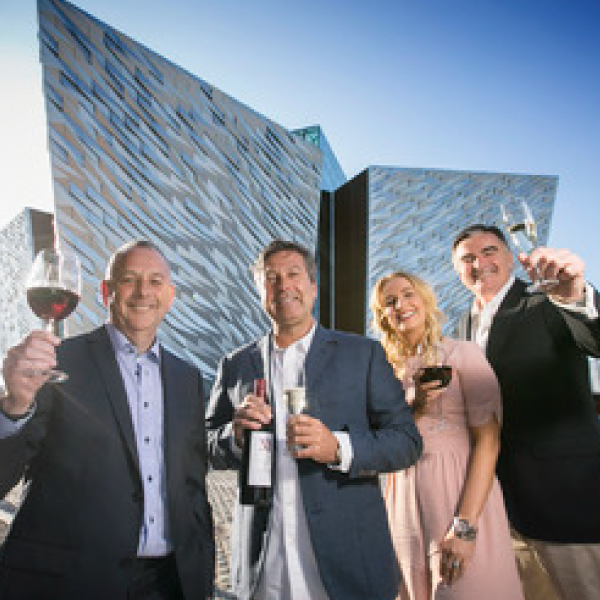 Continuing their successful partnership, Neil McGuigan and John Torode have launched their new MT Tempranillo at an event hosted by United Wine Merchants at the Titanic Hotel Belfast. Guests included valued trade customers, representatives from the media and social media influencers. Guests were treated to a six course wine and food pairing menu in the Titanic Hotel. Canapes were served on arrival with McGuigan Sparkling Chardonnay Pinot Noir which was followed with Marinated Scallop Salad with Single Batch Chardonnay. After a pallet cleanser of blood orange and rose wine sorbet, beef fillet was served with Single Batch Shiraz and followed by Young Buck blue cheese and the new MT Tempranillo. Finally guests enjoyed a dark chocolate and salted caramel torte with McGuigan Sparkling Shiraz. United Wine Merchants were delighted to once again welcome Neil and John to Northern Ireland and to introduce the new MT Tempranillo to trade customers and media. The new wine is launching at a time when European varietals, and Tempranillo in particular are seeing a period of increasing sales and popularity amongst UK wine lovers.